Tonight I want to discuss a few things about two wheels.. For those of you that have followed my blog for awhile you know I love two wheels with a motor. Like many kids I grew up on two wheels without a motor. I can honestly say I haven’t spent much time on a bicycle since I was 14-15 years old. Recently my Queen mentioned going on family bike rides. I instantly said lets do it! I always loved riding bikes and spent many hours a day on them when younger. There was only one problem. I didn’t own a bike. Finding a bicycle without spending a fortune was a challenge. The biggest problem was that I needed a small or extra small frame. These bikes are not easy to find used. I ended up finding a bike I liked at Dicks. It is a Nishiki Pueblo with a 16″ frame which is pushing my limit. Now given I didn’t buy my bike from a bike shop I got home and instantly started checking nuts, bolts, shifting, and other adjustments. It struck me that I was doing a T-CLOCS inspection on my bicycle. 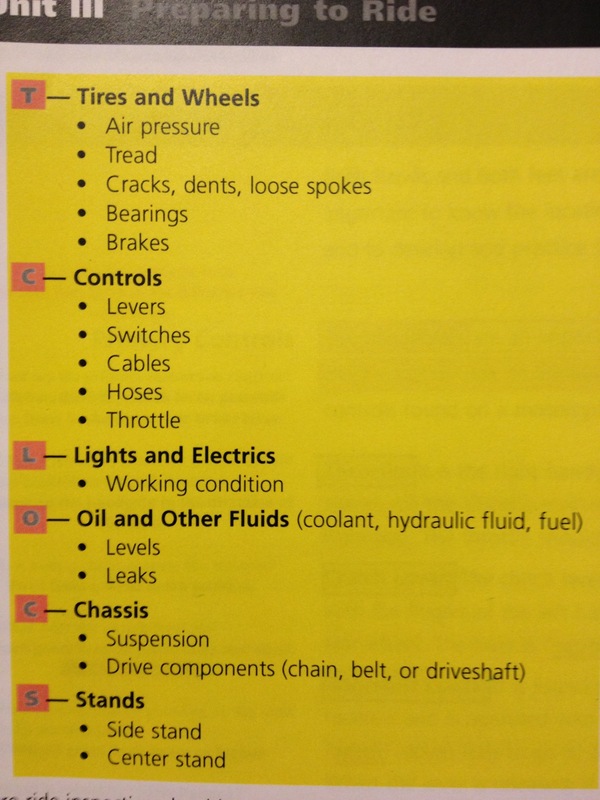 For those that have never been through a motorcycle safety class take a look at the diagram below (you should do it on your car as well). I am excited to be back on the non motorized bike; so much so that I took my shiki for a nice three mile ride to get a few a few groceries this evening. I look forward to spending time as a family adventuring places a car just cannot go. Don’t think I would put out a post that didn’t talk metal detecting. I already have plans to get a detector bag so that I can ride to the multiple sites I have within a few miles of home. It is quite obvious that doing some pedaling won’t hurt my physique any! I also think it would be fun to take the bikes out geocaching. I wander who makes an Iphone mount for a bicycle? Happy hunting whether it be metal detecting, geocaches, or just peace of mind and relaxation! Sunday I returned to the homestead that I’ve been hunting. I was only there for about an hour. 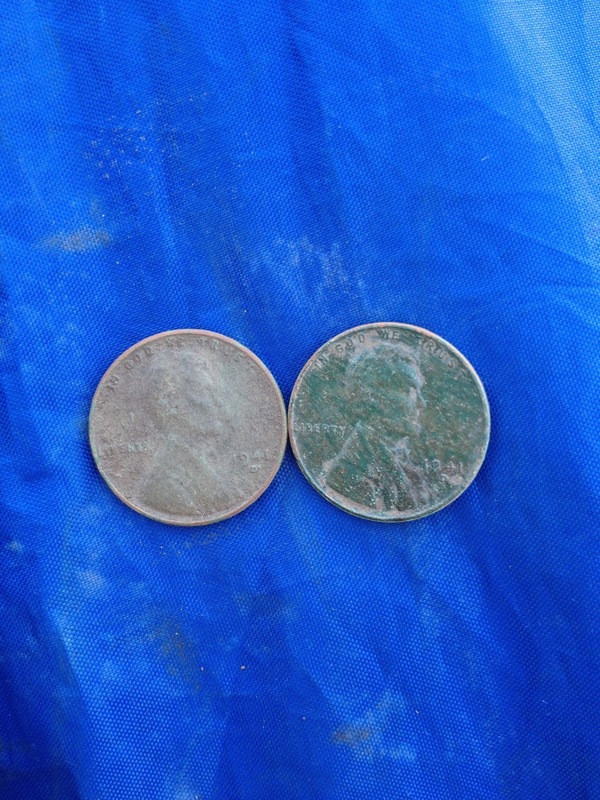 I found some neat relics and one copper coin that was unidentifiable. 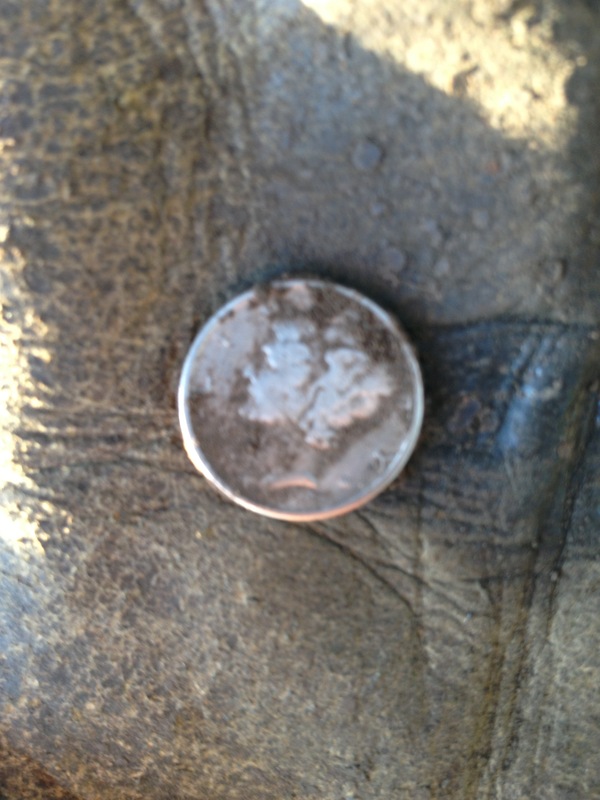 The copper coin ended up being a 1953 wheat penny which I believe had been through a fire. I will wait a couple of weeks to reveal the other relics because they are getting cleaned. I have been searching for a way to remove rust from iron that wouldn’t damage the relic. I do believe I found it but I won’t know for sure for a couple weeks. The concoction I’m trying is 1 part molasses to 8 parts of water. I have seen quite a few promising results that made me decide to try it. The bad news is it takes two weeks to work it’s magic. As I right this it is thundering and lightning out. I hope this leads to some rain. We need it as the ground is getting quite hard due to mid 90 temps and steady winds. Happy hunting and thanks for reading! My thoughts on those who want to learn how to metal detect..
My first time with Twins..
Let’s start by saying this isn’t shocking news from Queen Ukena. It’s also not the male fantasy that is so popular. However, it is a first for me. This morning I stopped by my favorite before work park to do some detecting. 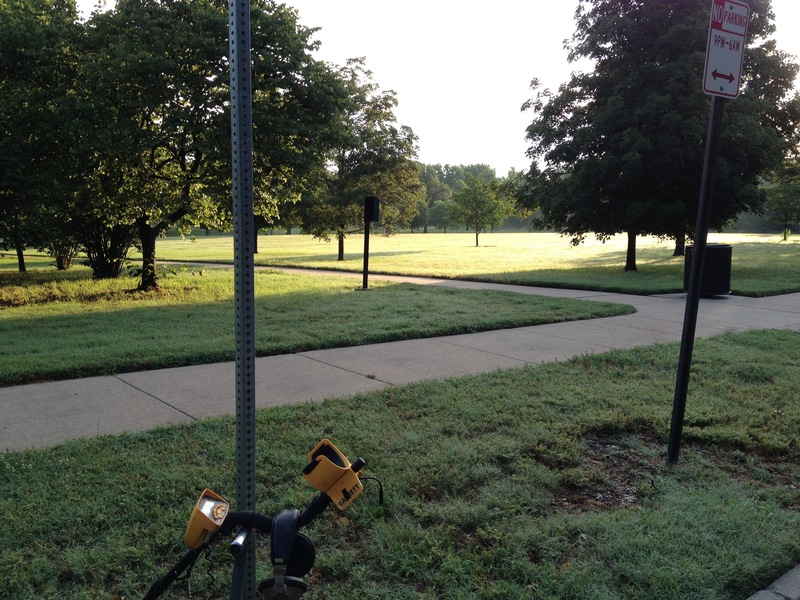 I parked the bike, pieced together the Ace, and got to swinging (my metal detector that is). After a few minutes the Ace told me there was something good in the hole. It didn’t sound like a round object but it seemed good enough to dig. I was pleasantly surprised to see a 1941D Wheat Penny. I rescanned my hole and plug and received another sweet sound. To my surprise it was another wheat penny. It was even more cool that it too was a 1941D. I checked for any other signals and came up with a beavertail from those old style pulltabs. 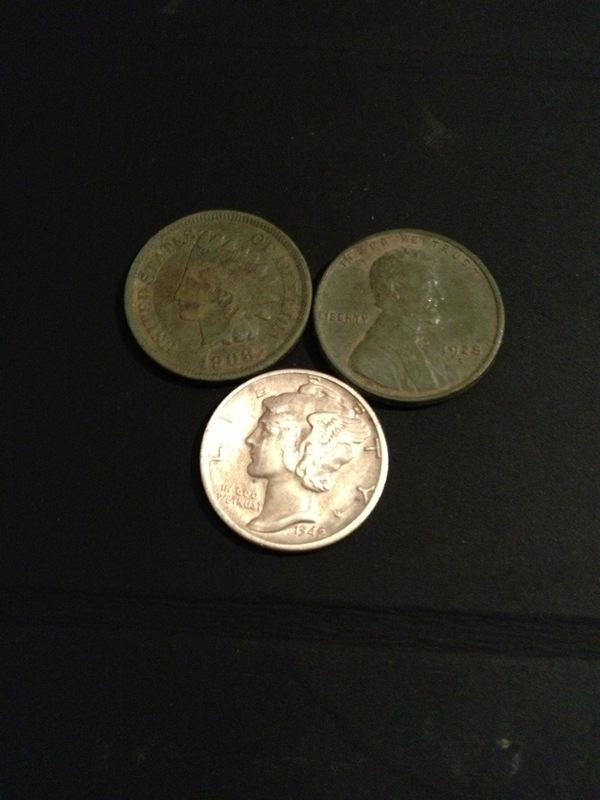 I continued the hunt and found a few pulltabs and a common nickel. Needless to say I think the warmer weather is promoting my gold fever. I wanted to write today about my Fathers day. Being a Father of 3 sons makes everyday a great day. There are days that they drive me crazy. There are days they make me proud. There are days that the make me laugh. In the end I’m just thankful that Queen Ukena and I have been blessed with them. This Fathers day was different than other Fathers days. I started the day doing some home maintenance. I finished up with that at around 11:00. We then headed to a family/friends get together where we enjoyed a ton of fresh seafood and some adult beverages. My Father-in-law showed up with a concoction of beer, vodka, and limeade that was quite refreshing in the warm weather. Needless to say it was a good time. I had made plans a couple weeks ago to meet up with Pulltab Miner and another area hunter at 3:00 so our stay at the party got cut a little short. We all met at the site I wrote about in Yes You May and Monday Eve Mojo. This site is a very cool old homestead that belonged to the local banker in the 1870’s. We were super excited to get our hunt started. I walked about 30 feet into the front yard and turned my machine on. Before I put my headphones on Miner was excited about a signal he was digging… The first swing of his machine he pulled a buffalo nickel! This just got our blood pumping that much more. It didn’t take us long to learn that this site was extremely infested with iron. Within an hour or so Miner had found an Indian to go with his buffalo. 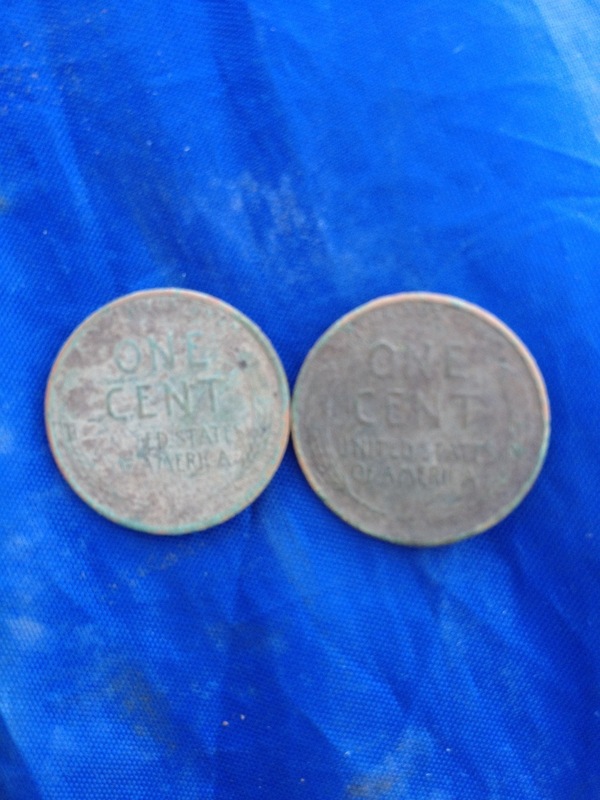 I managed to pull a couple of old wheat pennies (1919S & 1920). We ended up hunting for about 4 hours and I can tell you that was quite the feat in the heat. The three of us did manage some pretty cool relics for the homeowner. They are involved heavily in the historical society and asked for the relics. We found square nails, harmonica and accordion parts, buttons, pieces of horse tack, and other things. By far the best find of the day came from the other area hunter. He found a Sterling Silver spoon that we think to be a teaspoon. We could see that it said Sterling but the makers mark was quite worn. Once the homeowner gets the piece cleaned it may become clearer. I can tell you that these property owners are the most involved that I have ever seen. They blessed us with a big jug of cool water, mowed the grass nice and short for us, and took our relics in to give them the initial cleaning. I love the way some property owners enjoy seeing the little pieces of history we find. We will definitely be hunting this property more but maybe we should do it when the thermometer isn’t pushing triple digits! Thank you to everyone that made my Fathers day a great day. Well tonight I couldn’t resist the temptation to hunt my newest site. I am planning a trip back there this weekend and after tonight I am even more excited. Things started out kind of slowly and the detecting was a little tough due to high grass. I had dug a couple neat relics that will be returned to the property owner once cleaned, dated, and preserved (I kind of wish I had an arkie to help with this). I finally got a nice dime signal at 4″, I dug my plug and saw the shiny reeded edge. Finally my silver curse was broken and #14 was in the pouch. It is a beautiful 1942 liberty dime. I meandered around and dug a few square nails, an old doorbell, and then my second coin of the evening a 1928D wheat penny. I quickly got another coin signal and found a 1908 Indian Head penny. Once I got home I looked up the values of the coins and was pleasantly surprised at the value of the wheat. Then I moved to the Indian section of coinstudy.com. I saw the value of a 1908S and was hopeful. In the end the Indian wasn’t an S. I’m not complaining because this is the best hunt I have had in a month and a half. I am thankful that Queen Ukena tolerates me and this crazy hobby. While on the way home I called her to share my excitement and told her that I was sensing the need to go detecting tonight. Sometimes the inner voice whispers and I listen. Over the last month I have been doubting my skills, machine, and research but nights like tonight prove that you just have to get all three variables meshing and you will be rewarded. I would like to publicly thank the property owners as I am optimistic that this site still holds many cool things underfoot! This weekend I taught a MSF class all weekend. Saturday I managed to get out and do some site hunting. I stumbled upon an area that caught my attention. As I made a turn on a country road I noticed sidewalks to nowhere. I quickly noticed that there was some mature landscaping in place. I pulled in the drive and found the homeowners tending to their horses. I asked about the area and was blown away by what I learned. The house that previously stood on this plot was built by the town banker in the 1870’s. They granted me permission to metal detect around and we spent quite some time discussing local history. I was contemplating going ahead and detecting as it started raining on me. In my desire to get started detecting this property I had to head over there tonight. The youngest Ukena boy and I headed over there for a short hunt. I had planned on spending about 45 minutes hunting the site. That got shortened by a dirty diaper. 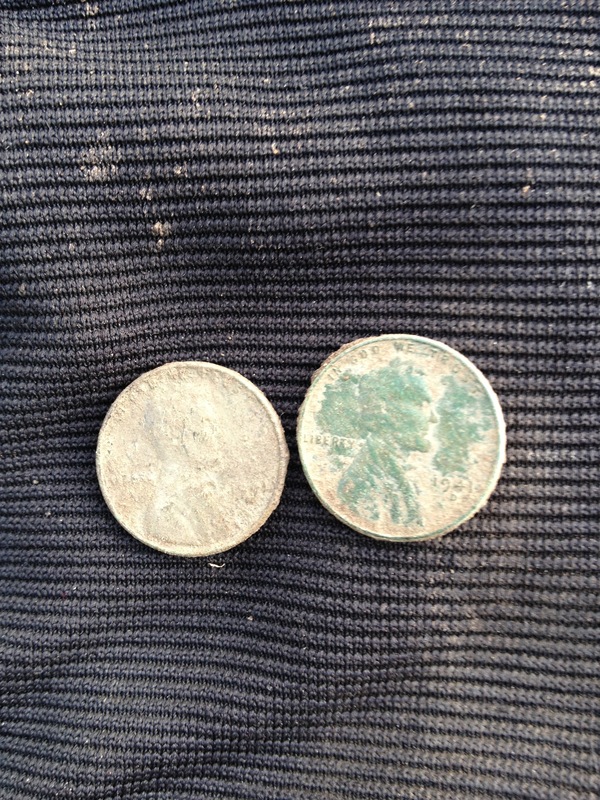 In the first 15 minutes I had dug a few old relics quite shallow. I am totally stoked to get back out there. Next weekend can’t get here quickly enough. First off I want to apologize for not posting anything in awhile. I just haven’t found anything that I felt was blog worthy. I have found some interesting stuff over the last few days though. I have been spending more time at one of Wichita’s oldest parks. I first hunted this park last summer and other detectorists told me to proceed with caution. It seems as fellow MDer’s have not had pleasant experiences in this park. To date I haven’t had any issues hunting in this park. It has been quite the opposite in fact. People are always asking how things are going and if I’ve found anything. I have been hunting this park before work and it kind of feels like an office or church on a Sunday morning. Everyone I see says good morning.. Over the last two days I have found some cool stuff including wheats, a buffalo, and other old relics out of a relatively small area and I’m certain that the silver coins I long for are lurking close. Hopefully these finds will give me the momentum I need to find it. What I really need to find is the metal trunk that Pulltab Miner said he found in this park and gave up on digging.. I can’t help but wonder what is in it. Well tonight I want to talk quickly about the wows and woes of this silly hobby. Woes- Don’t expect something good every time you go out. I am working on a six week silver slump. I’m not sure why but it is discouraging. I hope it turns around soon and luckily finding silver coins isn’t the only part of the hobby that makes it great. Wows- The last two days have been tremendously fun. The weather has been great and the company I have held makes it even better. On Saturday I took my little sister detecting. She had been wanting to get out with me for quite some time. We had a good time and I am guessing that the detecting bug will bite her sooner than later. We didn’t have any jaw dropping finds but we did have a great time. Today we had our second Wheat State Treasure Hunters meeting. We were a little unorganized due to event conflicts at our location and a little lack of planning. Everyone still seemed to have a good time and I had the opportunity to help a young lady learn the basic operation of her detector. After I got all the Ukena boys ready to call it a night I slipped away to one of my honey holes. It is a rural farms that is pre 1900’s. It was such a beautiful evening that I ended up spending more time talking to the homeowner than I did detecting. It is always interesting learning more history from someone who knows all about the happenings of 100 years ago. In the end I can say the friendships and people I have met in this hobby are well worth it.